There are spacious room available to rent in this renovated 60 m², 2-bedroom apartment in the heart of Ixelles. The apartment is fully furnished and fully equipped, but has plenty of room to add your own personal touch. The kitchen and living room have an open-layout, creating a comfortable common area. There is 1 full bathroom to share and an extra hallway for storage space. Ixelles is known for its diversity, which you can experience through the international restaurants just minutes from the apartment: Japanese food, Vietnamese food, and steak houses. In addition to food, there are grocery stores, banks, and shops all within walking distance. The apartment has big windows that fill it with natural light and also block out the street noise. Both rooms are spacious with high ceilings. The apartment is surrounded by public transportation, but you have a grocery store right across the street. There is no washing machine. There is a bus stop steps away from the apartment serviced by day and night buses. The closest metro stop is Porte de Namur (M2, M6), which is less than a 10-minute walk away. You also have tram line connections a 10-minute walk away. 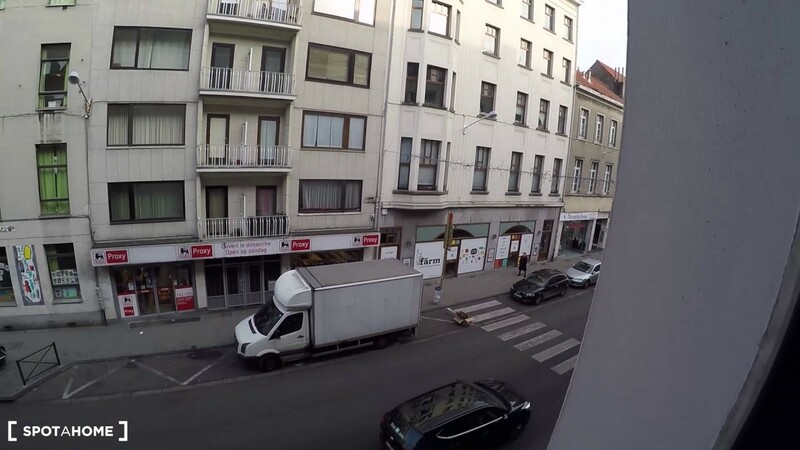 For travelers, the apartment is near the Bruxelles-Luxembourg train station.